Love me so Vu on a Monday morning and this post is, as usual, on target. It is a good list to remember and post on my wall. Please read the post in full – His 10 agreements are as follows. We will assume the best of intentions with one another. We will not get pissed off at anyone for failing to fulfill expectations we never clarified. We will give feedback honestly and directly and not be passive-aggressive. We will focus on specific behaviors, not attack personal character. We will give each other chances to learn and improve. We will not get pissed at anyone if we’ve never given them feedback and a chance to improve. We will not form cliques nor spread gossip. We will own our part in any conflict. We will own our part in creating and implementing solutions. We will not take our jobs for granted. Vu Le is a writer, speaker, vegan, Pisces, and the Executive Director of Rainier Valley Corps, a nonprofit in Seattle. 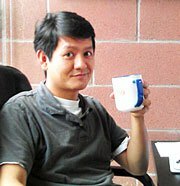 Known for his no-BS approach, irreverent sense of humor, and love of unicorns, Vu has been featured in dozens, if not hundreds, of his own blog posts at nonprofitwithballs.com. He is also the humor columnist for the awesome nonprofit online magazine, Blue Avocado. Vu enjoys talking about himself in the third person. Entry filed under: A Better You, Nonprofit fundraising, Shared Posts, Stuff I Love. Tags: 10 Agreements for a functioning team, becoming a leader, nonprofit effectiveness, Vu Le.